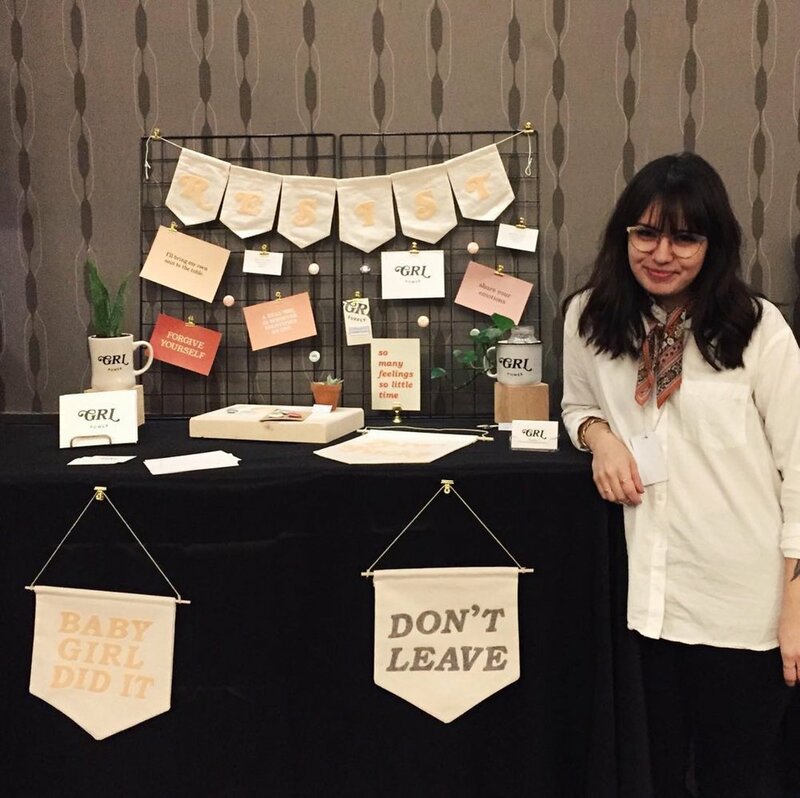 Marissa Baca is the graphic designer behind GRL Supply, a lifestyle brand that creates products to motivate and inspire. Originally from San Francisco, Marissa moved to New York to attend college and has been living in the city since. By day she designs graphic t-shirts for American Eagle, and started GRL Supply as a way to keep her creative side fulfilled. Marissa and I spoke about the origins of her project and how her four cats came into her life. Growing up, I was surrounded by art and my parents were artists. I went to a magnet art school in high school—I was homeschooled for general education subjects, but I went to a high school for art training. I originally went for photography, but then I found that I loved Adobe Photoshop. I’ve been using the program since I was 13. I did a pre-college program when I was a Junior in high school at RISD, and I was like “Holy crap, this is what I love.” I applied to a bunch of schools and landed in New York; I went to Parsons for Communication Design. I just followed what I was really interested in. Can you talk about your day job and what you do there? I’m a Graphic Designer for American Eagle but I specialize in apparel, so I say Graphic T-Shirt Designer or Graphic Apparel Designer. I work in men’s design, and I get my love of fashion and trend and people watching through this job, because I have to be up to date on what guys are wearing. It’s mostly branding, expanding on our brand and creating new ways of designing the logo. I do that with t-shirts, pants and shorts, anything you can think of we put a graphic on it. It’s intense since it’s the fashion world mixed with the corporate world mixed with design, so there’s a lot happening. How did GRL Supply get started? When I was in school I had a thesis project called Emotional Packages. I created packages that would help someone going through a hard time—there was one for a break up, one for being depressed, and one for feeling lonely. I loved that project so much and I had so much fun doing it that I always knew I wanted to expand it. When I started my day job after I graduated I kind of felt that there was something missing and I needed to replace this missing feeling. I thought, “I’ll restart my college thesis and go from there." I started trying to work on the idea but it didn’t feel like before, so I decided to try something new. I had started making banners for my thesis but I didn’t know how to sew so I glued them. I taught myself how to sew and worked on new banners. One day I was looking at three of my cats—I have a tattoo with two of their initials before I got a third one, that was Lola—and I decided to get rid of my thesis idea, keep the same integrity of lifting people up and helping people cope through designed words and call it GRL, so it’s GRL Supply. That took about a year to develop. What goes into creating items for GRL Supply? It’s whatever I’m feeling at the moment. I haven’t been able to get into a streamlined production, so it’s not organized. It’s really whatever I feel. Something will pop into my head during the day, or I’ll get a feeling and I’ll write it down, and I’ll go home that night and design something, print it out and start cutting letters. Or sometimes I’ll sit on an idea for a long time, and get t-shirts printed or get stickers made. Those are for the ideas that I’ve sat on for awhile, but my banners are more my impulsive feelings. How do you balance having a 9-to-5 and running GRL Supply on the side? I’m still figuring that out! Some weeks I’ll totally forget about GRL and not do anything for it because I let my day job take over, or some weeks I’m productive and I’m writing things down, sketching out designs, and I go home and I start making them and I don’t sleep. I don’t have a balance, I just maintain keeping my head above water and that’s how I operate from day to day. It’s almost like when you live paycheck to paycheck, there’s not much of a balance that you can keep. I’m 25 so I’m managing it, but hopefully the balance will come one day. Where has GRL Supply been featured? A friend of mine started the Queens Craft Brigade—he came to me and told me he wanted to start this market that’s inclusive and welcoming and loving and asked me to design the logo. I was onboard. I did the logo and I design the posters every time one takes place. I’ll be at Renegade Craft Fair on June 23. I was in Bulletin, they carry smaller female artists within their store. I try to do collaborations and work with people through GRL Supply, so it tends to expand my channel past who I am, and I hope to do the same with whoever I’m working with. I worked with Sister House Collective from Las Vegas—that was super fun, I made a tote bag for Women’s Day. On a most average day I wake up around 6:30, 7 am, whenever I can drag myself out of bed. I feed the cats and then get ready. Sometimes in the morning, more times than not, I will find something that I made for GRL Supply to photograph because the lighting is the best in the morning. I get ready, make a smoothie, go in my studio to find something to photograph, get as many photos as I can, run to the train, edit photos on the train, post on Instagram because I normally post once a day, and then I get to work and that blows by. I normally go immediately home after work because I’m so fried and I hang out with the cats. I put on Shark Tank and I’ll clean or prep a new GRL Supply project. I also spend time with my boyfriend but that’s in the middle of everything. How did you end up with four cats?! It all started with Gatsby, the G in GRL. I was living in my first apartment in Brooklyn, I moved in with my best friend, and she found a cat. It came into our house and had kittens under my bed, and I adopted all of them out because we weren’t allowed to have pets. One of cats that was adopted out, his owner couldn’t keep him so I took him back, and she had named him Gatsby and the name stuck. The second cat is Raia but I call her Ray, she was a gift from another roommate who came home very drunk and decided to gift me a cat. The third one ended up in my life at the same time the fourth one did. The fourth cat is mainly my boyfriend’s, and his sister is Lola. They were born in the backyard of my boyfriend’s old apartment and we rescued them because I’m a registered TNR (Trap-neuter-return) and got them neutered and cleaned up. We weren’t supposed to keep those two but we fell in love. And they all get along. All four of them will sleep in the bed with me at once, but then you get out of bed and you have cat hair everywhere. I always have five lint rollers around the house. What’s up next for GRL Supply? In my ideal dreamworld GRL Supply would be my only job and it wouldn’t even feel like a job. What’s next is for me to find—I was going to say for me to find my happy place with GRL Supply but I am in my happy place with GRL Supply. I think it’s to find what GRL Supply means to other people and then expand on it, and then never stop! What’s your sign & how do you feel about it? I always answer this question in a funny way because I was born on June 20 but in the early hours, so I’m a Gemini if you look at it that way, but I feel I’m on the Cancer cusp. Depending on what website you read some say I’m a Cancer, some say I’m a Gemini. I relate with the surface traits of Cancer, like being a homebody, but I think I really am a Gemini but I don’t want to admit it. What was the last book that you read and what are you currently reading? The Brief Wondrous Life of Oscar Wao, and I gave it to my brother to read, but this was before the news came out about the author (Junot Diaz). I’ve also read This Is How You Lose Her; the main character tried to be good towards women and then in the end he wasn’t, so I’m wondering is this really you? How do you look at that art now? Where do you live & what are three spots that you recommend in your neighborhood? I live in Ridgewood, Queens. It’s fun and can be quiet or it can be loud. I’ve always lived off the M train, I’m following it deeper and deeper into Queens. I love my deli guys and I get a little bit of the city and a little bit of the suburbs and it really feels like home. There’s this taco place called Mally’s, it’s so good. Another place is Aunt Ginny’s which is a bar that has food, and another place is Norma’s which is a coffee shop that has the best breakfast.